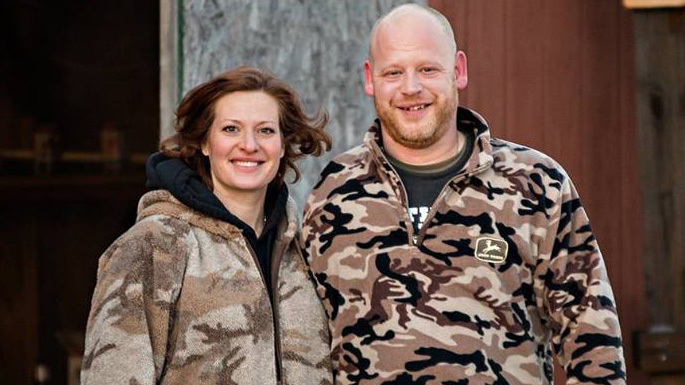 Living not far from me in New York are Mark and Denise Beyers, two Marines who now run a small farm outside of Buffalo, New York. They have a thriving maple syrup business and also sell honey, eggs, and turkeys during the Thanksgiving season. And they told me, if they don’t sell all the birds for the holiday, they freeze them and eat turkey through the winter. As I begin to think about Christmas, and as I reminisce about my wonderful time spent with the Beyers, I suggest making Turkey Breast with Apricots, a fabulous dish for those special dinners when you do not feel like cooking a whole turkey. It cooks faster and the recipe can be doubled, using two whole breasts, for a big crowd. To meet the Beyers, tune in to Lidia Celebrates America – Homegrown Heroes – December 15, 2017 at 10pm. (check local listings). In a medium bowl, combine the apricots and bourbon. Let soak 10 minutes. Remove the apricots, reserving the bourbon. Finely chop half of the apricots, and leave the other half whole. Rub the softened butter over and under the skin of the turkey breast, and season all over with 1 1/2 teaspoons of salt. In a roasting pan, heat the olive oil over a medium heat. When the oil is hot, add the carrots, celery, and onion, and cook, stirring occasionally, until they begin to brown and soften, about 6 minutes. (If you have the neck or giblets, add them with the vegetables to brown too.) Add the chopped apricots, and season with the remaining teaspoon salt. Pour in the reserved bourbon, and add the rosemary. Add the stock, bring to a simmer, and cook until reduced slightly, about 5 minutes. Fit a rack in the roasting pan, over the vegetables, and set the turkey on it, skin side up. 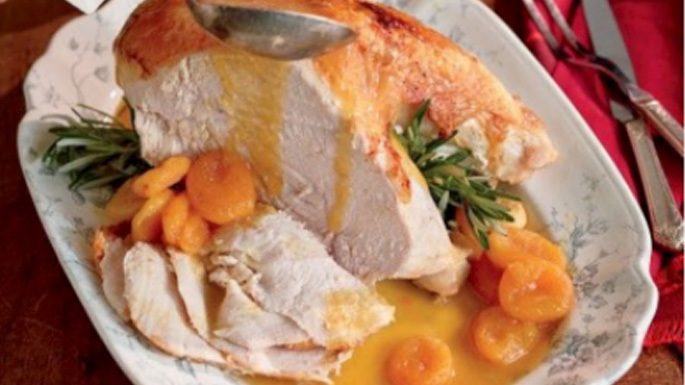 Throw the whole apricots into the sauce around the turkey. Cover with foil, and roast 45 minutes. Uncover, and roast, basting the turkey breast occasionally, until the thickest part of the breast reads 165 degrees on a meat thermometer. Let turkey rest on a cutting board while you finish the sauce. For the sauce, pluck out the whole apricots and set them aside. Pour the rest of the sauce into a medium saucepan, and mash with a potato masher (or put through a food mill into the saucepan). Let the sauce sit for a minute, and skim any fat from the top. Bring the sauce to a simmer, and stir in the whole apricots. Slice the turkey, and arrange it on a platter. Spoon half of the sauce over the sliced turkey. Serve the extra sauce on the side. From: Lidia’s Celebrate Like an Italian, by Lidia Bastianich, and Tanya Bastiancih Manuali.